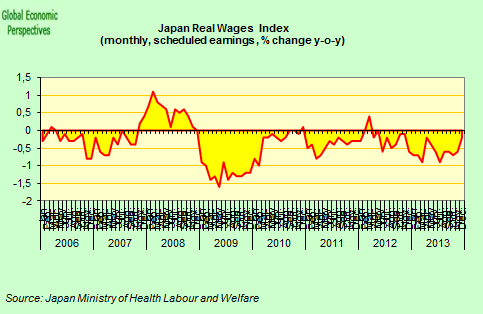 Here’s one simple chart which illustrates why I think Japan style deflation is now more or less inevitable in Spain. Curiously it comes from the Ministry of Employment and illustrates the relation between the movement in average wages caused by actual movements in the real wage and those caused by what is known as the “compositional effect”. This latter is known by this name because it is the result of movements in the composition of the workforce, whether this be in terms of the average skill level or the average level of experience (or seniority premium, if you prefer). Seniority has historically played a very important part in the Spanish wage structure – ie the longer you have worked the more you are likely to earn. Now if you look at the data superficially, you find that in the first years of the crisis average real salaries went up sharply (the blue line). This surge in average salaries was not due to salaries actually rising to this extent, rather it was the result of the composition of the workforce having changed (the average skill level went up) as unskilled workers in construction lost their jobs. Hence the 2009 spike in the composition effect. 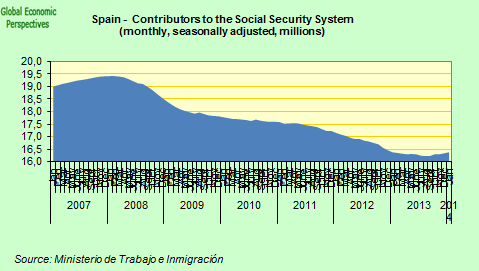 According to Bank of Spain data in 2008 skilled workers represented 23.55% of the total while by 2012 the proportion had risen to 28.2%. On the other hand, over the same time period unskilled workers fell from 14.8% to 10.2% of the total.This naturally had an impact on average wage levels. Now, however, the labour market has stabilised, and unskilled workers are no longer losing their jobs (at least not in net terms). According to the Spanish newspaper Expansion the Spanish statistics office estimate average hourly labour costs (not unit labour costs, note) fell in Spain by 2.9% en 2012, 1.9% in 2013 and they are expected to fall another 1.7% this year. Again, looking at the chart you can see that the green (compositional effect) line which surged in 2009 has now flattened. It has flattened but the impact is still there and has stabilised at a more or less constant rate. Subsequently it is quite possible that the compositional effect will even turn negative due to the impact of the 2012 labour market reform: average salaries are no longer falling due to labour shedding producing a changing skill composition but due to AGE CHURN. Older workers with long term contracts and lots of seniority are being steadily replaced by younger ones on less well paid contracts, thus dragging down the average wage. The line is flat and extends out in to the future. This can go on for years now, and indeed the compositional effect can even turn negative.This is exactly what has been happening over the years in Japan, and is the principal reason why Abenomics isn’t working. 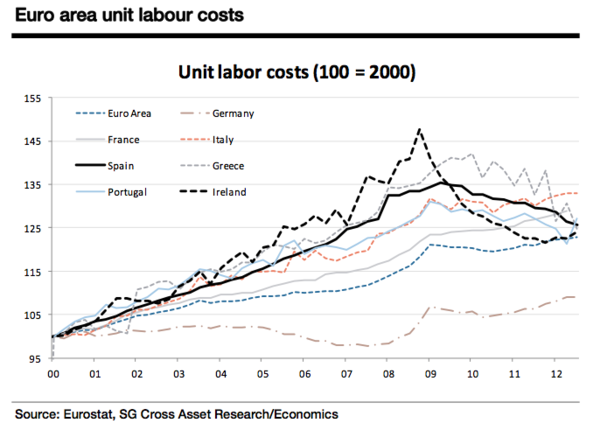 Incidentally, here I have been talking about average hourly labour costs NOT those famous unit labour costs. These, as we all know, fell significantly in Spain after the onset of the crisis. What isn’t so well understood is that this fall wasn’t due to falling hourly wage costs (these didn’t really start falling till mid 2010, see blue line in chart) but due to massive labour shedding. 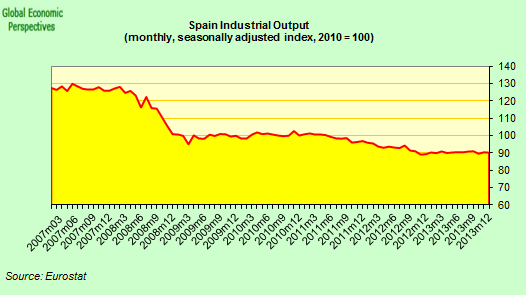 Spain’s GDP has fallen by something like 7% while employment is down by around 20%. On the surface this shows a large gain in productivity. Where this gain is actually coming from hasn’t been sufficiently analysed yet, but part surely comes from a compositional shift in the labour force. One thing is, however, reasonably clear and that is that it hasn’t come from industrial productivity, since industrial output is down by some 30% since the pre-crisis peak, even more than the reduction in employment. (I’m afraid you’ll have to stare very hard at the industrial output chart if you want to see signs of the much proclaimed recovery – you’ll have to stare very hard since there is so little sign of it). 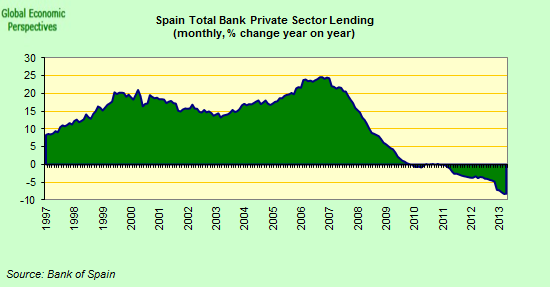 So why do I think this suggests deflation may become endemic in Spain? Well, with average real wages falling, real pensions falling, and credit still shrinking by around 6% a year it is hard to see where the demand is going to come from, especially with very little happening in the way of new employment – the shortfall is becoming structurally implanted. 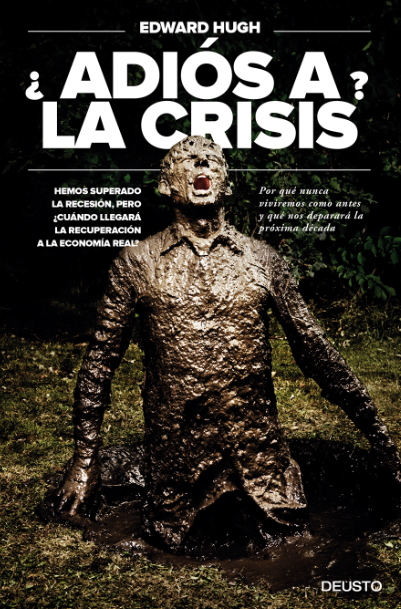 For more argument on all this (in Spanish) see my book which is being published by Ediciones Deusto next week. You can find a list of chapter headings here. This entry was posted in A Fistful Of Euros, Economics, Economics: Country briefings by Edward Hugh. Bookmark the permalink.